Something a little different has been going on for the past 12 years at a McDonald's restaurant in New Britain, Conneticut (outside Hartford). Every Wednesday night for the past 12 years Sam Kimble and his ad hoc Stardust Band have been performing at the McDonald's on West Main Street in New Britain. The band and the dancers are area senior citizens out for a night on the town at the McDancehall. 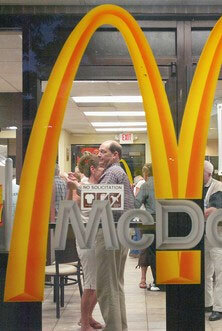 And, oh yes, the McDonald's is open and serving while all this is going on. Video journalist Carolyn Moreau put together a video of the weekly event. Photos and video and story at the Hartford Courant.